USA Basketball Managing Director Jerry Colangelo and Head Coach Mike Krzyzewski watch practice on July 20, 2016 at Mendenhall Center on the University of Nevada, Las Vegas campus in Las Vegas, Nevada. 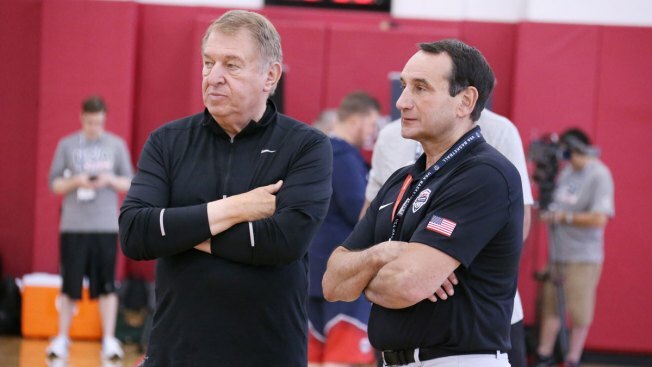 Nearly every time coach Mike Krzyzewski and USA Basketball boss Jerry Colangelo stage a reunion in their hometown, there's plenty of backslapping, a trophy gleaming in the background and the only thing they have to protect is their cocktails. This time around, it's about safeguarding the Olympic legacy the two built over more than a decade. Their partnership took hold in the wake of the "Abomination in Athens," when a U.S. team coached by Larry Brown and packed with high-maintenance, highlight-reel guys who slept through wake-up calls couldn't rouse themselves in time for the medal round. 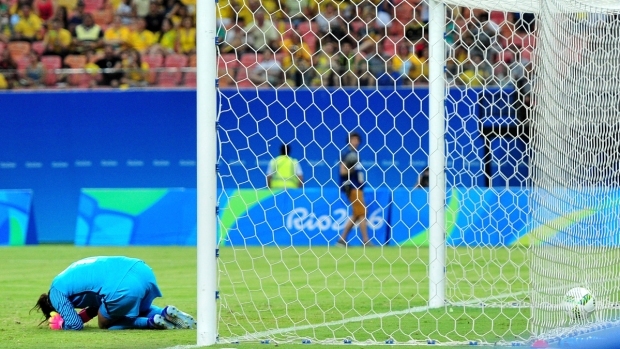 They left the 2004 Summer Games with a consolation prize of bronze and the program's reputation in tatters. Colangelo, a former NBA and MLB executive and once a fine athlete in his own right, agreed to pick up the pieces on one condition: "I get to make all the rules." Once he shaped a roster that reflected his philosophy — that the best teams are made up of complementary parts instead of just the best ones available — there was only one guy Colangelo wanted to coach them. "We're both Chicago guys through and through," Colangelo said Thursday, while the Team USA practiced for Friday's exhibition here against Venezuela. "A lot of the bond we felt right off the bat had to do with the lunch-bucket beginnings both of us had." Gold medals at Beijing and London followed in their wake, and the mix of players buzzing around Krzyzewski at practice — bona fide NBA stars like Kevin Durant and others like Kyle Lowry and DeAndre Jordan, who bring specific skill-sets to the floor — suggest their approach hasn't changed. The only surprise about this edition is Colangelo found yet another way to get Coach K to sign on for another tour of duty. "There's usually lots of wine involved, but it hasn't really been that tough," said Colangelo, laughing. In 2009, both were on hand for a National Association of Basketball Coaches "Court of Honor" gala feting Colangelo and Team USA's success at the Olympics a year earlier. Colangelo worked the room in his familiar style, shifting his drink often to avoid spilling it as he accepted handshakes, hugs and posed for pictures with old friends. Krzyzewski, who served as toastmaster, still hadn't made up his mind about London. "We got that taken care of at 3 a.m. that morning in the lobby over pizza and wine," Colangelo said. "I remember after London, Mike was really wiped out. I thought I'd lay low and didn't bother him for two weeks, then he called me. 'Jerry,' he says, 'I'm already going through withdrawal.'" "Yeah, we're both Chicago guys, but I'm Polish and he's Italian," Krzyzewski said. "He's always reminding that they have better restaurants and more of them. "I hate to say it," Coach K added a moment later, "but he's probably right." That kind of continuity at the top of the program sets the tone, but it doesn't explain all the success. Syracuse coach Jim Boeheim, who's been along for the ride as an assistant, describes both men as "strong-willed" and "problem-solvers," but also "guys who are smart and secure enough to welcome input from the team, top to bottom." "You'll never hear them say this is 'their program,'" Boeheim added. "It's everybody's program. They make that clear from the outset. Guys buy in faster and stronger when they feel an ownership stake. They feel respected and listened to. ... If you want to know the 'secret,' it's that. They share the credit and the responsibility." "We're going for Italian," said Colangelo, smiling. "I know a great place downtown."